Last year, about 16,200 trade visitors from 76 countries visited the exhibition and 891 exhibitors from 31 countries were present. There were 3,500 machines were in live operation and top-class presentations at three expert forums. 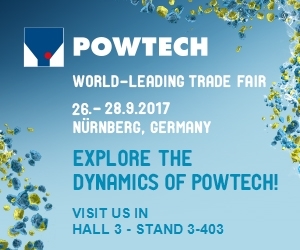 We cordially invite you to visit us at PowTech 2017! Register online from 15.08.2017 at www.powtech.de/voucher using the voucher code for your free e-ticket. Send us an e-mail to obtain your free voucher code.